Did you sew this weekend? Did you watch the Super Bowl? I did though I admit it is always to see the commercials. Yes, the “Lost Dog” Budweiser commercial made me cry. On the sewing front, it was more pressing and cutting than sewing.. I added some fabric to both the Reproductions and the pink/orange/yellow projects, and got pieces cut for blocks on both. I probably didn’t need it but I did it anyway… it’s that physical vs. emotional dynamic – I didn’t physically need the chocolate croissant I had with my coffee yesterday morning but it made me very happy. More fabric is always better, right? I also pressed these fabrics with a little starch and got them cut. I’m thinking I should have messed up my stacks a little bit as this looks a bit… compulsive. Yes, orange and black. Don’t ask me how it happened but I’m now working on four projects. These strips are for the Go Four It Quilt-Along party that American Patchwork & Quilting Magazine and ModaLissa are having. Are you quilting-along? (Please say yes.) I know you’ll be surprised to learn that I’m making my quilt a little differently. I’m using six or seven different backgrounds, including the Passport New York City map print. I also wanted to see what I could do to help with acquiring some of those nifty notions and cool “quilty stuffus” I showed last week. It’s simple, the first best place to go is your local quilt shop to ask the owner if they’d be willing to order it for you. It’s what I did for many years. I would show up to greet my new BFF with a stock number and credit card – I always offered to pre-pay for whatever it was hoping to order. Because there are usually minimum order amounts, I was also willing to wait until they had other items to order, or I made sure my list included several things. I’m a firm believer in asking… the worst thing that can happen is someone says “no”. 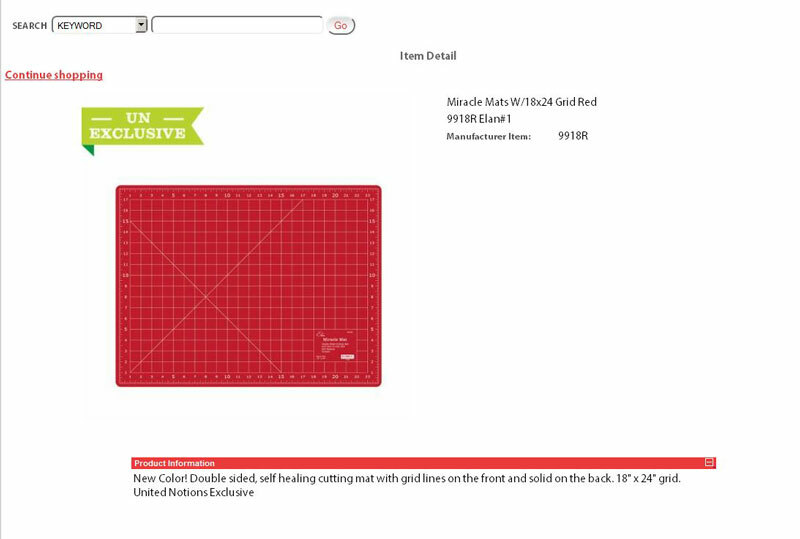 For something like rotary cutting mats – the red Miracle Mats – shipping is the reason they aren’t available online as they have to be shipped flat. As someone who once ordered a cutting mat from <insert name of the Kindle people here> and had it arrive folded in a box. It had also been on a UPS truck all day – a 90-degree day in Phoenix. I think they regretted asking me for “packaging feedback”. So how do you find the stock number? 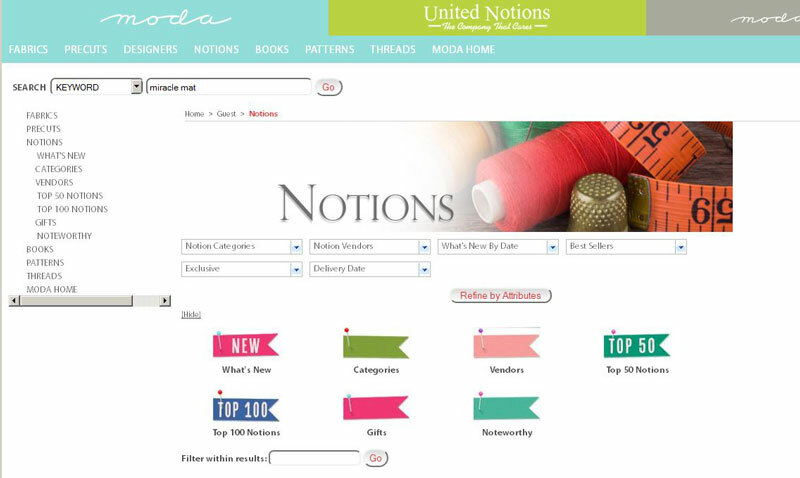 Go to Unitednotions.com and click Notions – it’s right under the Moda at the top. 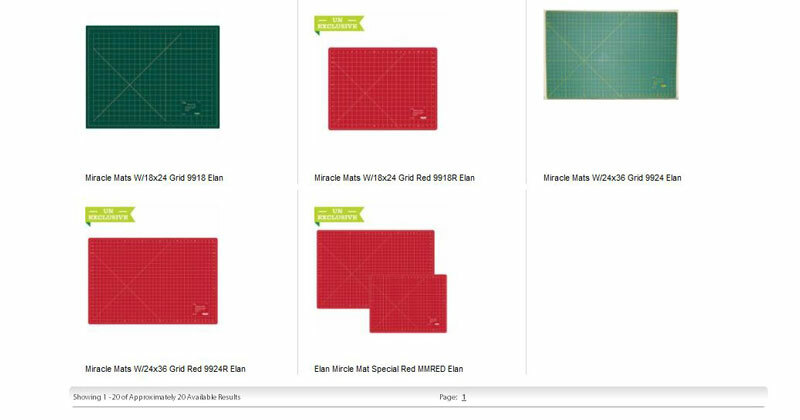 At the bottom of the page are three red mats – two different sizes and a set of two. Click one of those. On the next page is the number you’ll want to provide to the shop owner – it’s the Manufacturer Item No. I always included the description and specifics since I do sometimes transpose numbers. Do you see the green banner? That means the only place this mat can be ordered is through United Notions. Hold on to your hats… I’ll be back tomorrow. I love those red cutting mats, but REALLY want the fabric spray from one of your earlier posts….and here’s the fun part. When you live where I live, the “local” quilt shop is a full day’s journey away….so online shopping with shipping becomes imperative…will keep scouring my favourite online stores, and some new ones, in hopes of finding these items. They look great. Can’t wait to see your new quilts, Carrie. Your fabric stacks are incredibly tidy, mine never look that good. Superbowl? No, did not watch – for me, the Superbowl is a great six hour excuse for quilting in peace and quiet!!!! But I do love the commercials, and am a huge fan of all those amazing Superbowl snacks and recipes!!! Oh I really love the pink and yellow fabrics you are using. Great information. I love my Miracle Mats. I have both sizes. My only wish is I wish they were PINK. Hoping someone in the know is reading this. Love the black and orange you are working with. I have very little orange in my stash so I may have to visit my sister’s stash. I did sew all weekend. 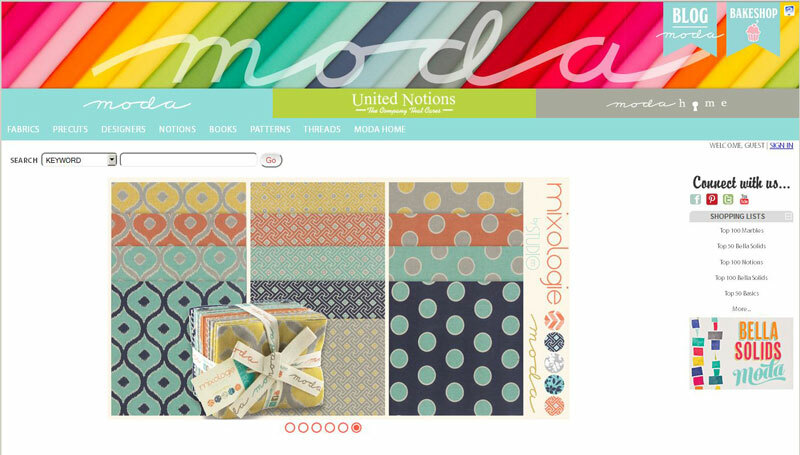 With your help I’ll be ordering some Moda Bella Solids for a new pattern my sister Candee is working on. I am working on three projects myself. One will be a new pattern. Looking forward to tomorrow’s posting. Have a great week! 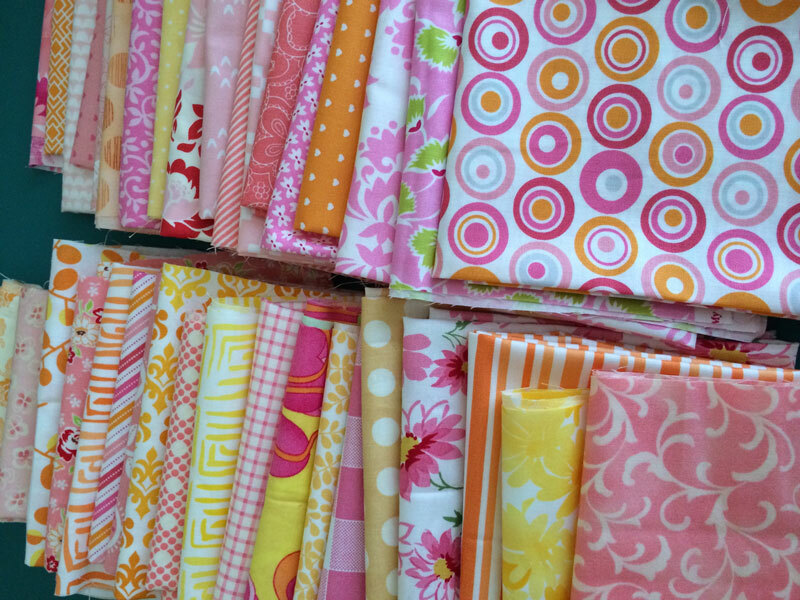 I adore the fabric in the yellow pink orange variety! How lovely and happy those are! And I am always up for something in Orange and black. So what’s the scoop on the miracle mats? What makes them so much better than others? What are some of the fabric lines you are using in the orange/black/cream quilt? Your fabric choices for the APQ quilt are perfect, why didn’t I think of that! Thanks for the tips on navigating the notions web pages, very helpful!! Thanks for all the great information. I love my red miracle mats! They’re thicker, more substantial than the green ones and, best of all, pretty. Thank you for all the inside info! I have to ask do you use a Go Cutter or do you rotary cut? That is funny because I was think the same thing. Go Cutter or rotary cut. Oh those red mats!!! I will be asking my local shop to order them! 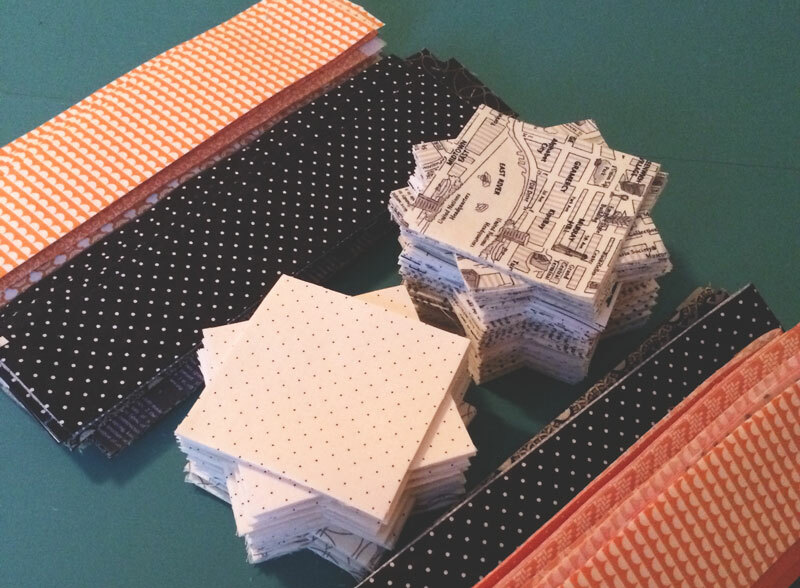 Love seeing your little compulsively stacked piles of squares… makes me think ‘easily counted, organized, ready to sew’. Don’t ever change ’em just because messy might be in at present. I did watch the Superbowl — as I was fabric surfing on my ipad. It will be great to see the finished products of both sets of fabric. Love the pink/orange/yellow! I am a new quilter and enjoy seeing the process of quilting. I have one of the green mats and love it but red is more my style.